Two popular forecourt owners believe the Applegreen success story continues in Mullingar and Irishtown, and speak with warmth about their new relationship with the innovative forecourt retail brand. 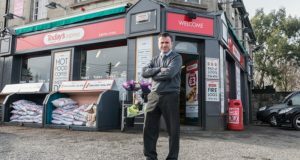 Noel McIntyre, owner of McIntyre’s Spar Service Station on the Dublin Road, and John Eivers, owner of Spar Irishtown Service Station, have both transformed their sites and their business by joining the ‘low fuel prices, always’ brand. Speaking to Ireland’s Forecourt & Convenience Retailer, Noel described Applegreen as an Irish success story. But it was his first meeting with the company that energised his decision to make the change. “When I first met with Applegreen at their headquarters, there was an atmosphere in the building that everyone was in control and knew where they were going, and that they weren’t afraid to do things differently,” he said. Noel’s long-established site is major part of community life in Mullingar, Co Westmeath. Opened in 1967, it was formerly known as Westmeath Motors before revamping into a modern forecourt in 1972. 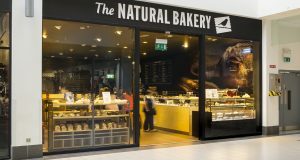 Now the store is a 4,500 sq ft strong, high-end convenience retail outlet, featuring a Spar convenience store packed with popular brands such as Insomnia Coffee, Four Star Pizza, and Smooch. Explaining his decision to join Applegreen, Noel explained: “In very recent times, we identified a significant shift in forecourt retailing,” he said. Not only does the bright, modern Applegreen canopy highlight the Spar store’s forecourt, but it is also a gateway to the site’s other major retail outlet – an Aldi. But Noel explains that far from unwanted competition, the Aldi is indeed there by design. 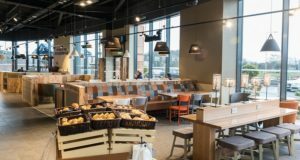 “We were approached by Aldi and did a deal, so on the site we have a forecourt sharing the entrance to Aldi, making it a consumer hotspot,” he explained. According to Noel, joining Applegreen has also offered the opportunity to grow his volumes “in a big way”. And with Applegreen’s recent deal to take a 50% stake in the Dublin Oil Terminal, there is a swell of positivity over what that will mean for Applegreen’s competitive advantage in terms of fuel prices and consistency of supply. John Eivers’ site in Irishtown, Kilkenny, is a little younger, opening in 1997, but no less ambitious. The 15,000 sq ft service station and Spar convenience store features a jet wash, and an unusual canopy. The curving glass A-framed canopy is a stand-out feature of John’s high volume site, which enjoys a significant local regular trade requiring some 15 staff to keep the store running smoothly. Speaking about making his decision to join Applegreen, John explained: “Applegreen are flying ahead in this region of the country. In the last two years I noticed the industry was really on the move and that Applegreen was shifting the goal posts in the market. John has been in the retail business since he was a school boy, and still loves the industry. Having worked across the whole sector, he has a vast reserve of experience to call on, and he believes Applegreen are leading the way. The Kilkenny retailer added that in his experience customer felt the same way. John’s enthusiasm for the brand has been inspired by the strong working relationship he has already struck with the team, which he describes as “professional” and “supportive”. “I have found the Applegreen team very professional, especially in the advice they have given and the recommendations they have made,” he said. John spoke highly of Applegreen’s business development manager, David Watson, saying he had taken the unique requirements of the site and John himself on board. “He was very understanding and could see where I was coming from,” John explained. “David got a feel for what was needed for my site, and I’ve been very happy with the support I’ve received.